What could possibly be better than creamy mac & cheese with bacon? Nothing! Preheat oven to 400 degrees F. Cook pasta until al dente. Drain and remove from heat. 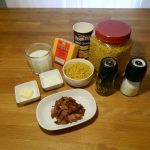 Make cheese sauce: Melt butter in medium saucepan, then add bacon and flour. Cook for 2 minutes until flour turns golden. Slowly add milk, and simmer until the mixture thickens, stirring constantly. Remove from heat, stir in 3 cups cheese, setting aside remaining 1/2 cup. 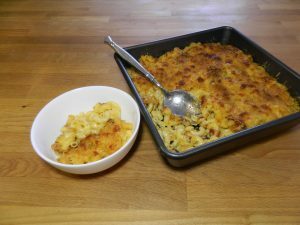 Add macaroni and stir until cheese sauce and macaroni are well mixed. Pour into greased 9 x 9 pan. Top with remaining 1/2 cup cheese and bread crumbs. Bake for 12 minutes, until topping is golden brown. Fun Fact: Tillamook makes more than 100,000 pounds of cheese every day!